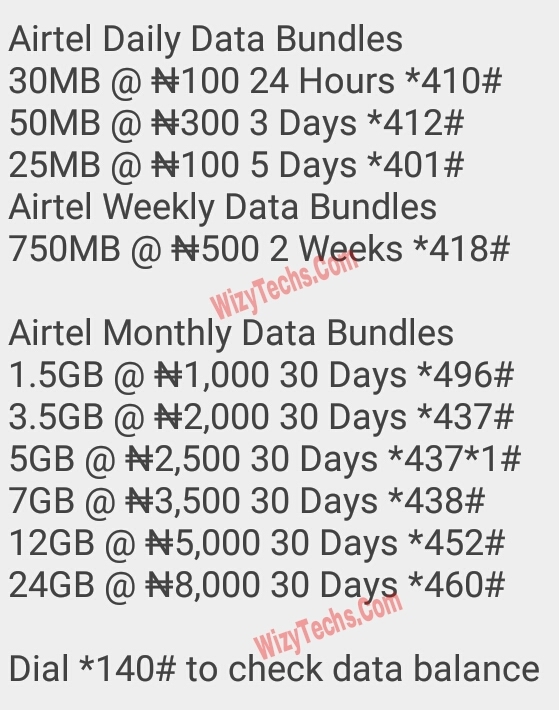 I advise all Airtel subscribers to go through these best data plans listed here including the prices, validity period and code to subscribe to each and everyone one of the data plans. In Nigeria, when it comes to networks with reliable 3G service across most cities, towns and even villages, Airtel is among. Airtel network is one of the fastest and that's why many people has their SIM just for internet browsing purposes and other online activities. Am still saying that "recession" didn't affect data plans in Nigeria because i could remember when we used to pay N1000 for just 200MB data some years back from Airtel but now it's a history. In this article, I will "review" all the Airtel data bundles for 2017. The most important thing is these bundles works on almost all devices - all Android phones, Tablets, iPhones, iPads, Modern, routers, USB dongles and can be tethered and shared via WiFi, Bluetooth and USB chord. Before now, network providers used to give just 10MB with N100 but that period is long gone. There are lots of positive changes in the data sector and we the users are enjoying more data with lesser amount of money. Just like MTN, Airtel has increased the size of data allocated to the N100 naira card from 10mb to 30MB. This plan is sure to help you finish up whatever you are doing for the day when you eventually exhaust your data plan. It's the "savior plan" that keeps you going. This plan is valid only for 24hours and the subscription code is highlighted below. This one is not impressive considering that Glo offers same 50MB for just N100. Also, at Airtel's official website, it was stated N200 instead of N300 which is the actual price. This plan valid for 3 days but i suggest you check other plans below to make a better decision because this one is a no no for me personally. If you are using a jarva phone, this plan is best daily plan for you. Also if you are using Android phone but what you always do is chatting, this plan is also good for you. For N100 Naira, you’d get 5MB every day for 5days to surf the internet. On paper, there are two weekly plans on the Airtel network but I am focusing on the best out of the two. Just like MTN, Airtel offers 750MB for 500 Naira which valid for two weeks. But while MTN gives you one week for this plan, Airtel thinks you should cool down and enjoy your data up to 2 weeks. Yes Airtel tagged themselves "the smartphone network" after they started offering cheaper data plans that works on Android devices even before other networks started doing same. We have lots of monthly plans from Airtel and I will be reviewing them here one after the other. Although, Globacom still rules when it comes to cheapest data plans in Nigeria. This plan is the most popular plan in the country. Airtel offers you 1.5GB worth of data for 1,000 Naira. This plan is their Android 1.0 plan but as stated on their website, this plan works for all devices. I have tested it, and it truly works and unlike their blackberry plans, the data consumption rate is reasonable. In other words, it doesn't zap like older plans some years back. The plan will last you for one complete month. For just N2000, you’d get more than double the amount of the data allocated to the cash equivalent of the previous plan which is also valid for 30 days. It's like, the more the prices the more the data allocation. Smart business trick if you ask me. When you add another 500 Naira, you get an additional 1.5GB data. What am I saying? With your N2,500, you get 5GB to surf the web anyhow you want for 30 days. Still on the matter, if 5GB won't be enough for you in a month, my brother, my sister say hello to the 7GB plan which will cost you N3,500 and valid for one month. 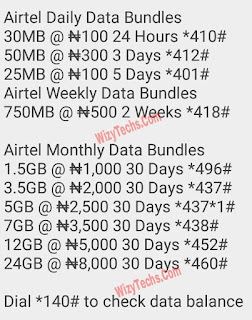 Airtel offers 12GB worth of data for 5000 Naira. This plan is suitable for bloggers, business owners who uses the Internet for their services, online freelancers and the likes. Still on the matter, for more power users, you can get a Whooping 24GB for N8k valid for 30 days. Some people value whatsapp more than any other thing else that's why you see some that don't care about any other plan except the one that allows them chat on whatsapp and follow groups. Airtel is strongly behind you. That's it guys. Which one is your favorite plan. I believe this review will help you make a better choice when it comes to data subscription this month. Happy browsing!!! great article,but the airtel 0.00 has stopped working for me,have anyone experience that and is there any solution wizy?? Some People say that the WhatsApp plan is only for ten days. oga wizy what abt airtel weekly plan 100 for 1g.. does it still exist ? Lemme kick start my comments by thanking wizytechs for rebranding this post in a more detailed way. I'm grateful to AIRTEL for coming up with their night plans because it has really helped me in getting my laptop updated. thanks oga wizy am so greatfull , for you sharing this post with us all.thanks to airtel for bringing back the double data plan.i have noticed that airtel are trying their best to bring data prices low so that it can be affordable to everyone,and I can see that airtel is becoming the best network in Nigeria.talking about the night plan they have also helped so many people for introducing the night plan which says 25naira for 500mb and 200naira for 1.5gig but people always like doing the one of 25naira for 500mb because they that it is cheaper than the other one,even me too Iike the one of 25naira for 500mb because it has helped me alot in different ways like downloading movies,games and even read news online.so I will say thanks to airtel for all the good things they have done in helping all Nigeria to access the internet in a cheaper way. so coming to glo network I will First say thanks to oga wizy for sharing this timely and helpful update with us all,i can say glo are also trying their best in introducing cheaper data plan to all Nigerian who always browse the internet, and I will say thanks about the night plan from look I will say glo night plan is a little bit costly.because theirs is 200naira for 1gb,and I can see that this is where airtel are better than glo and other network because everyone can't afford the one of 200naira because they say all hand are not equal.so thanks to oga wizy. but I can see that airtel has a cheaper data plan than other network but the only about airtel is that you hardly find airtel free browsing trick and that of mtn is the worst.so half bread is better than none.so thanks to airtel. looking at Glo free browsing cheat.i think glo are the best network in terms of browsing treak.because you can hardly find out that there is no free browsing cheat on Glo network.with this I will say thanks to glo network. Bringing in GLO into a post that was strictly meant for AIRTEL is not really a welcomed idea. so I can say both network are trying their best in terms of free browsing and cheap data plans. so good job to airtel network. is this airtel offer still on 100naira for 1hour unlimited free browsing. If you are very conversant with social media most especially twitter, you’ll notice that Airtel NG have one of the best video advert so far and now again, they’ve given another astonishing video advert, a pointer in the right direction… telling you that unlimited data is coming soon. I’d long waited for this unlimited data offering from our Telcos and hopefully Airtel is planning to unleash it soon… Maybe or maybe not their 4G LTE might be launched as well.